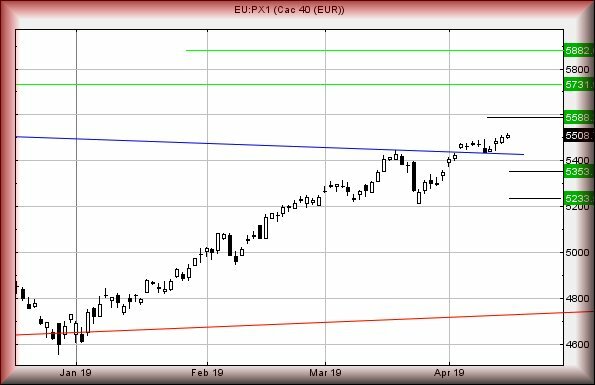 FRANCE CAC40 #Gold #DAX France’s bold effort to change the Paris skyline will probably dominate the news cycle, so it makes sense to examine the countries index. In common with Germany (and a lesser degree the UK) the market started April with considerable optimism, now to be buoyed with untold funds rebuilding the landmark. As for the CAC, it’s certainly showing some signs of becoming quite interesting. We’ve designated 5555 as a trigger level if it intends provide convincing recovery. Movement above this point looks capable of achieving a fairly tame initial 5588 points, along with some hesitation. Our secondary calculation is a bit more encouraging, calculating at 5731 points. This, visually, provokes a higher high, thus allowing us to calculate a third (and major) target level if the secondary is bettered, Essentially, it appears 5882 points shall provide a level where some serious hesitation can be anticipated. If trouble is coming, the index requires below 5411 presently, this allowing reversal to an initial 5353 points. If broken, secondary is at 5233, a point where the visuals indicate a bounce can be expected. 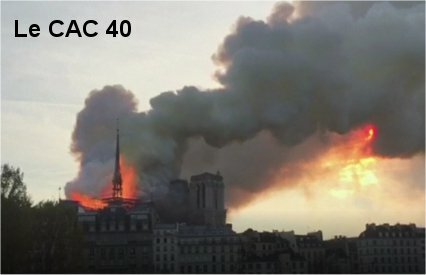 As for the Notre-Dame, while sharing no religious empathy with a building, personal fond memories of hours wasted in the early 1980’s, lazing in the square with students and watching the world go by – obviously prior to it becoming the unsavoury haunt of recent years. The fire is akin to watching memories burn, almost evoking the empty loss of that day on Sept 11th.